Tonight is the first of nine nights of Navratri 2014 in North America. Navratri (or Navaratri) is the Indian festival celebrating the goddesses Kali, Lakshmi, and Saraswati. They are all aspects of Shri Durga. Each night of Navratri is dedicated to a particular goddess who represents an aspect of the divine. 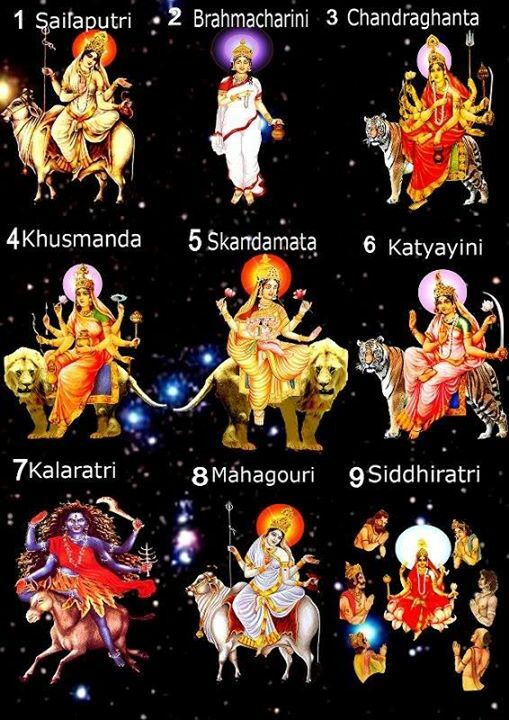 The nine goddesses of Navaratri are each described in the sacred Vedic text Durga Saptashloki or the Chandipath. They are often referred to collectively as Navadurga. Vedamurti Shri Vivek Godbole, the revered 15th generation Brahmin who heads the Shri Krishna Yajurveda Pathashala school in Satara, India spoke to me about the nine goddesses of Navratri. The first night is dedicated to Shailaputri (“daughter of the mountain”). Shailapurtri is another name for Parvati. Himavan’s (the God of the Himalayas) daughter is Paravati (“Mother Earth”). She performed many austerities to attain the right husband and after doing so, she married Lord Shiva. She teaches us to make effort to achieve our goals. Don’t be tired, but continue and go towards your aim forever. Follow your path. Perform austerities. When doing your sadhana, be silent. Think only about your master, guru, your goal, or the goddess. Shailapurtri teaches us how to be a good seeker. The 2nd night is for Brahmacharini. We usually think this is a woman who never married or desired to be with a male partner. But that is not correct thinking. Brahma means knowledge. Everything is Brahma; everything is knowledge. Brahmacharini is always studying. She never rests. She wants to attain more knowledge. This form of Navadurga is very helpful to all students. The third night of Navratri is dedicated to the goddess Chandraghanta. Chandra means Moon and ghanta is a bell. The Moon represents our mind in Vedic astrology, or Jyotish. The Moon is fickle, as is the mind. The Moon is continually changing its form. The mind is always fluctuating as well. Chandraghanta is ringing a bell and warming the mind to be cautious. She is commanding the mind, “Wake up. Don’t be fickle. Be stable.” She is always warning the mind, “This is not your true path.” Chandraghanta is like a GPS for the mind. Once the mind is stable, God is with you. The mind is a mediator. When the mind is not stable, then God is far away. 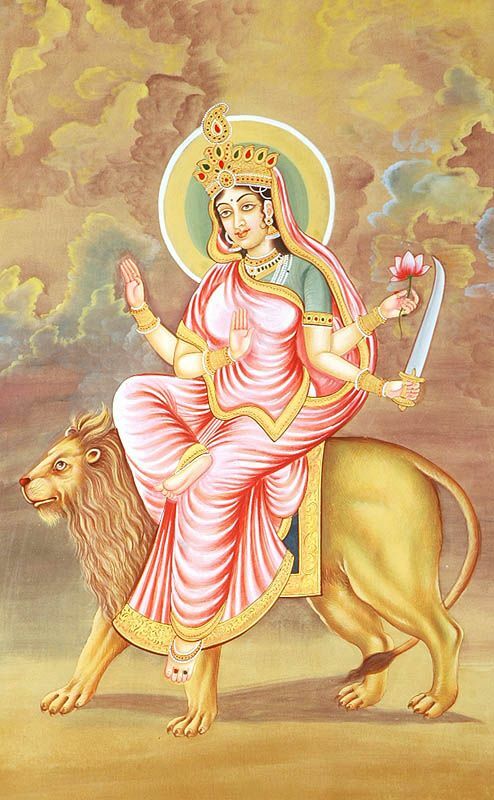 The 4th night of Navratri is dedicated to the goddess Kushmanda. She is like a fruit which resembles a white pumpkin. If you eat the kushamanda fruit (known as khoda in Hindi), you will have a lot of energy. That energy is like a warrior’s energy. People eat meat to get energy. This is not sattvic, it is rajasic. Goddess Kushmanda provides you with a lot of strength and she gives you rajaya Lakshmi. This is political strength. Additionally, if you have been under the influence of any kind of black magic or evil eye, she can remove those problems if you pray to her. The 5th night of Navratri is for Skandamata. Skanda or Kartikeya is Ganesh’s older bother. He is the commander of the Gods and Goddesses, and the head of the armed forces. 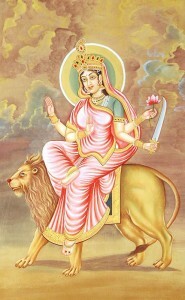 Skanda’s Mom is Parvati, or Skandamata. Every mother should think, “I would like to have a child like Kartikeya. I want good leader who can control a whole army if necessary. I want a strong and powerful child.” If every mother prays to Skandamata, then she will have a very strong and honest child. Skandamata grants fine children as well as good fertility. They want luxury and for others to fight. Skandamata says every person should have bravery and be a soldier in their own way. If every person is strong, then no one can conquer a country. Everyone will fear that country. When we pray to Skandamata, the children in your country will be brave and courageous. This 5th night of Navratri is also known as Lalita Panchami. The worship of a crystal Shri Yantra and Shri Vidya are done. Shri Yantra takes the form of the chakras in our body. There are six chakras in Shri Yantra. It is worshiped by people who want to attain God. The deity of the Shri Yantra is the goddess Lalita. To attain Guru krupa and inner peace, chant the Lalita Sahasranam or the Lalita Trishati. 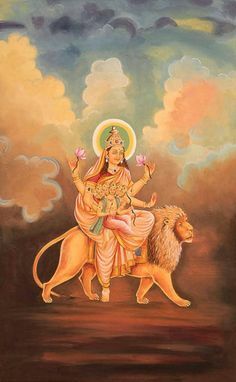 When Lalita appears in warrior form, she is Khadgamala. Offer her 48 bunches of druva grass to attain knowledge. The 7th night of Navratri is for goddess Kalaratri. She is very furious. She is black in color and her is not tied. She looks very dangerous. She teaches us to follow our true path and not go down the wrong path. Many people don’t have good sleep and they wake up in the middle of the night. Or they need to take sleeping pills. When she is happy with you, you will have very good sleep. Those who get good sleep also have their days go well. Kalaratri will help you and give you true knowledge. Kalaratri is a strong teacher. A good teacher uses strong words. These days, teachers can’t say anything to students and students are not listening to teachers worldwide. When you study with a strong teacher, you will have true and proper knowledge. The eighth night of Navratri is for the worship of Mahagauri. She is beautiful, very fair, and adorned with many ornaments. Her sari is also very precious. Women dance in front of her by performing dandia raas or garba. While dancing, they think that goddess Durga is dancing and playing with me. Mahagauri is a beautician. When you pray to her, she will beautify you in her beauty parlor. The last night of Navratri honors the goddess Siddhidatri. A siddhi is mistakenly thought of as magic and people want siddhis to walk over water or to fly. Eknath Maharaj says these are substitutes. You will never find God, but you will be deceived by these siddhis. Siddhidatri will open your eyes. She will show you what a siddhi is; what is true and what is not true. She is asking, “I gave you a beautiful form and mind, but how are you using it? You should use everything properly.” She will control your use of what you have. “ We can speak, sing, and express joy. We can express our thoughts with each other. Other beings can’t do that. Siddhidatri is saying, “I have given you innumerable gifts but you are crying like a beggar. You think, “I don’t have this, i don’t have that.” Think of what you have and then cry.” She will tell you what you have to think about that. Then you can ask for other things. When we pray to the nine goddesses of Navaratri, they will come to you in your dreams and your night and days will also be beautiful. To participate in a puja or yajna during Navratri, please send an email to soahamvg@gmail.com and you will be given further instructions. Please see the previous post for details on the various pujas.